Vilac White Ride On Classic Car is another vintage vehicle model created by the French manufacturer Vilac. Designed to provide hours of fun for children aged from 2 + , this ride-on car is suitable for both indoor and outdoor use thanks to its simple design and durable construction. Kids will be able to develop strength and motor skills, with the safety and reassurance of being able to plant both feet on the floor. 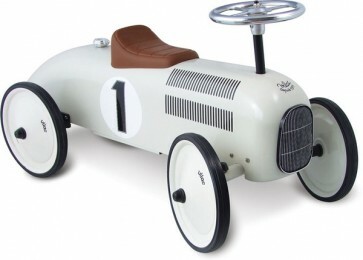 this rideon car also looks stuning when left on display as part of their bedroom decoration.